Another room complete, and I’m proud to say this one was our cheapest design yet. Total cost came in at $176. 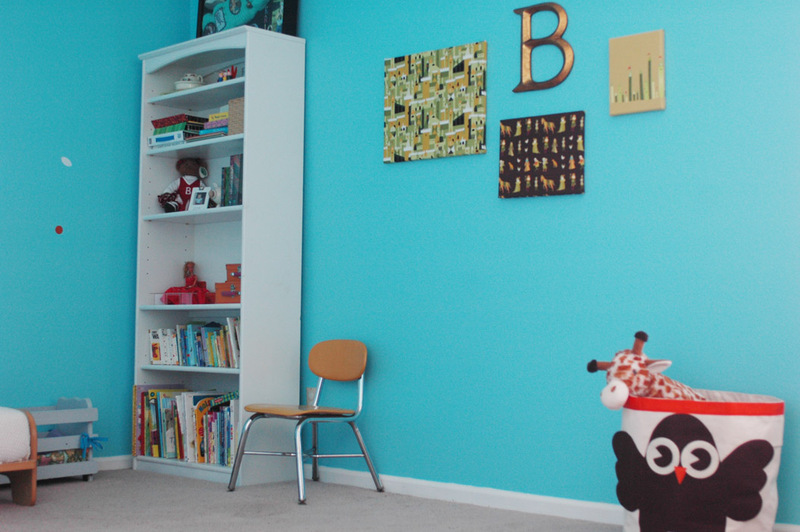 For B, we just wanted to give the room a little switcheroo and make it more fitting of her vibrant personality. 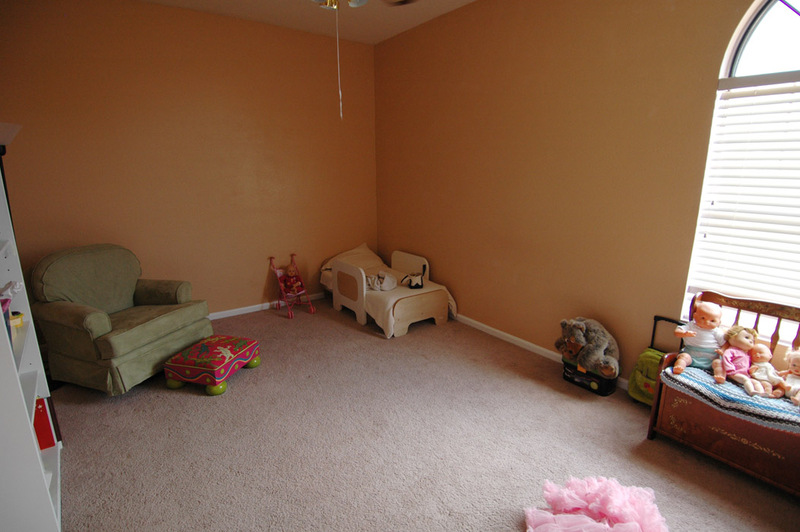 We already had all the furniture she needs, so it was mostly just a matter of painting, rearranging, and creating some artwork for the walls. Side note: I know some of you think I am cranking out these room makeovers at lightning speed. But, in fact, aside from the painting (which I do quickly to avoid displacing anyone from their beds), the rest of the work is completed over weeks of naptimes and evenings–whenever I have a spare 20 minutes to sew a pillow or finish an art project. I think if I had to wait for a huge (3-4 hour) block of time to work on our home design, it would never happen. So I’ve learned to bite off small pieces. Of course, I’m also motivated by the desire to make this unfamiliar house feel more like “home” as quickly as possible. Just kind of blah. Kris said it looked like she was sleeping in a big shoebox. The bedspread is a throw blanket I’ve had since college. I got the bird throw pillow and owl toy bin from Land of Nod using a gift card we received as a housewarming gift. The rest of the pillows I made from scrap fabric. I also made the fabric bunting. I LOVE L.O.V.E. this room! Great job! 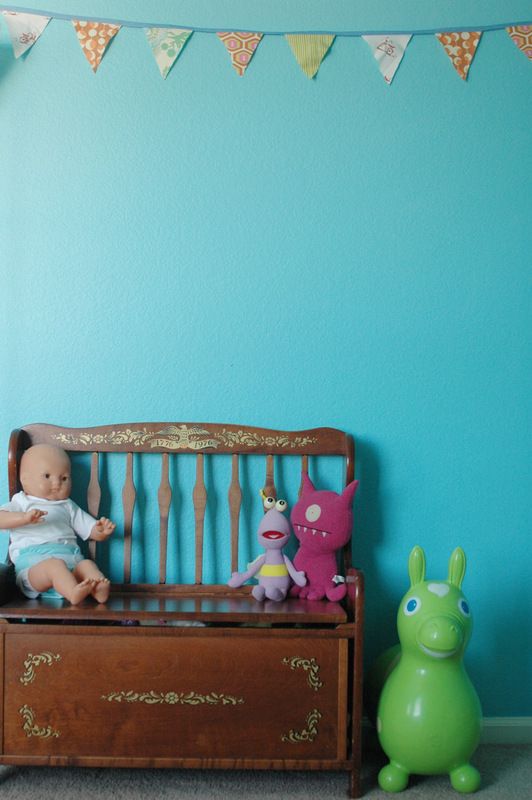 I love the little crib at the foot of her bed, the color, the chair…actually all of it! The wall mural was the perfect choice. And Rody! We have been waiting and waiting for one of those…great score! I love the tree mural and the pops of red against that blue. So pretty. I’m also jealous of Rody – $3 is a major score! Simply fantastic. What an inspiration! Love this room – it is gorgeous! Can you tell me about the bed rail(s) on B’s bed? Did you make them or buy them? Oh how you have inspired me to do something with my girls’ rooms! Though we live in a lease to own home which we plan to buy we are not to do anything to the walls, which are covered in gross wallpaper. But hopefully I can come up with something by the time I move our youngest to her sister’s huge room at the end of winter. @Claire: The rails are part of the bed. 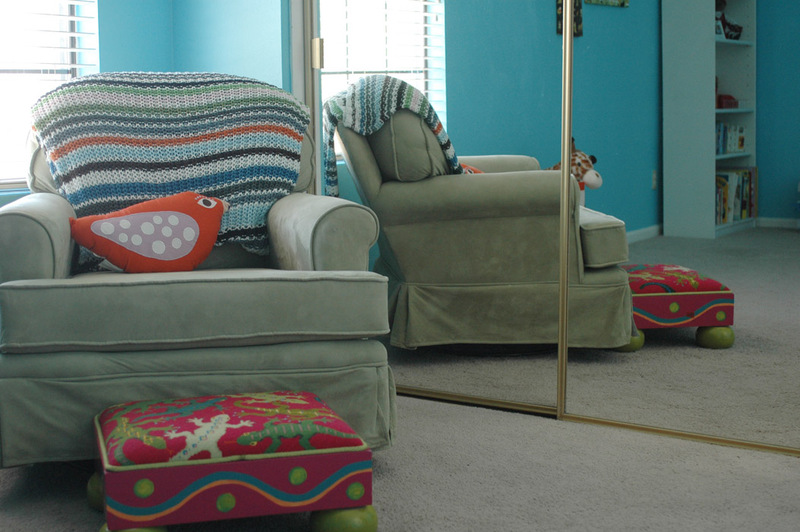 It’s the P’kolino toddler bed, which converts to a youth chair as well. We received it as a gift a year ago, but you can find it on Amazon and other retailers for around $200. What an adorable room! I love how bright it is and the use of the wall decal and bird/owl touches are so fun. Great job! So cool. And the photos are terrific too. Way to go Gina! what a lovely transformation! thanks for sharing it with us. love the paint color and bunting! glad to have discovered your blog…”b” is my all time favorite letter! this is just precious…wonderful job. I helped my granddaughter redo her bedroom this summer. We needed that man from “Designing for the Sexes” We could call it designing for the nut cases!!! Wow. But it turned out very nice. Finishing touches still need to be put in place. So darn neat Gina!! I am super impressed and I can only imagine how much B loves her new room 🙂 It looks fab! Can you e-mail me the name of the local craft store that you got the “B” from? I have been looking for one that size! 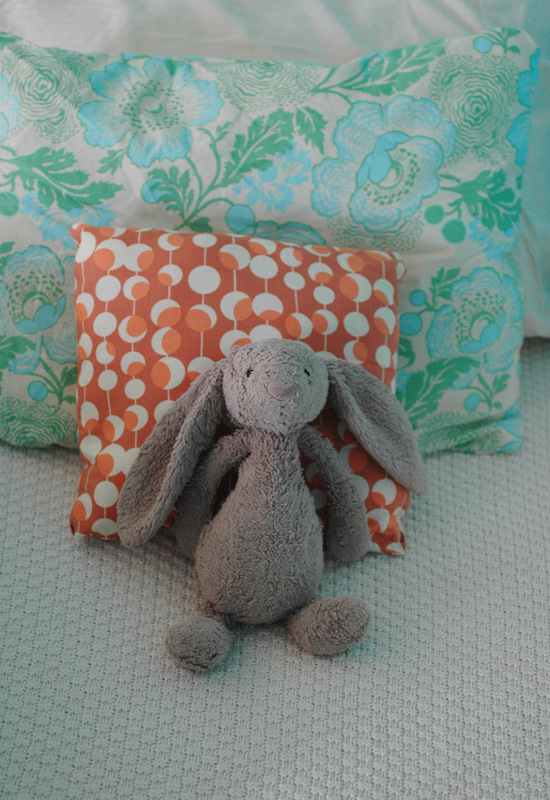 Love the room….love the bunny even more! My 4 year old daughter loves them just as much as me. Well…..maybe not. ;0) I must know where is he from????? Hope that helps! B never sleeps without him! love this bedroom. so cute!